How do you power a trolley without overhead wires? 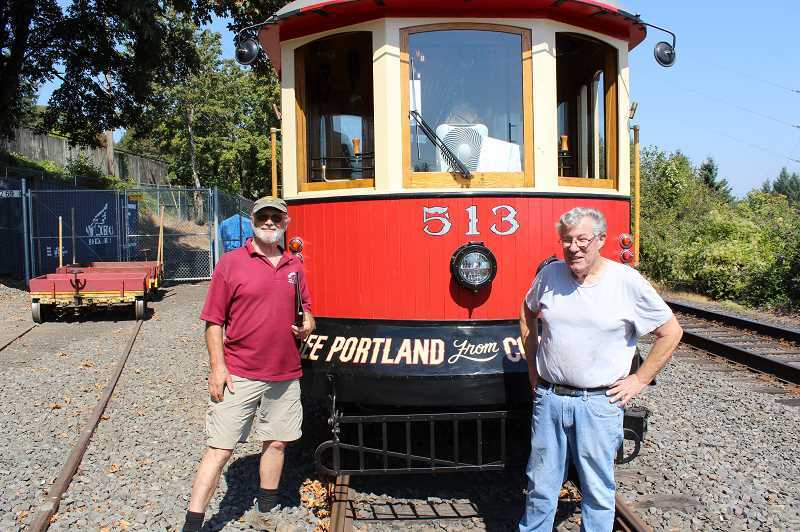 That's been the perennial challenge for the volunteers who operate the Willamette Shore vintage trolley line between Lake Oswego and Portland. Until now, the only answer has been diesel fuel, but group members say they're ready to pursue a new option: battery power. "This is a very important prototype project for how the line might evolve in the future," says trolley volunteer Gerald Fox, a retired light rail system designer. "Some pretty substantial work has been done on the line over the years, and this is just the next step in a progression of upgrades." A century ago, the Willamette Shore rail corridor was equipped with overhead electrical wires that supplied power to Southern Pacific's fleet of Red Electric commuter trains that ran between Portland and Lake Oswego. Service was discontinued at the end of the 1920s due to the rise of the automobile and bus, and the overhead cables were subsequently removed. Southern Pacific abandoned the track in 1984, and a consortium of local agencies — Lake Oswego, Portland, Metro, TriMet and Clackamas County — stepped in to purchase the six-mile line and its right-of-way to preserve it for transit use at some point in the future. The purchase agreement allowed Lake Oswego to operate a trolley service on the line in order to maintain the right-of-way, and the City contracted with the Oregon Electric Railway Historical Society (OERHS) to operate a volunteer-run vintage trolley on the line. The operators immediately faced a conundrum, Fox says: Vintage streetcars are all driven by electric motors powered by overhead wires, but reinstalling overhead wiring on the Willamette Shore Line would be prohibitively expensive. As a solution, the operators mounted a diesel generator on a cart that can be pushed or towed by the trolley, supplying electrical power to the motors. That's been the trolley's propulsion system for the past three decades, and a succession of three different vintage trolleys operated on the line until 2013, each powered by a diesel cart. In 2014, TriMet discontinued its vintage trolley service in downtown Portland and leased two of its historic trolley cars — numbered 513 and 514 — to the OERHS to run on the Willamette Shore Line. 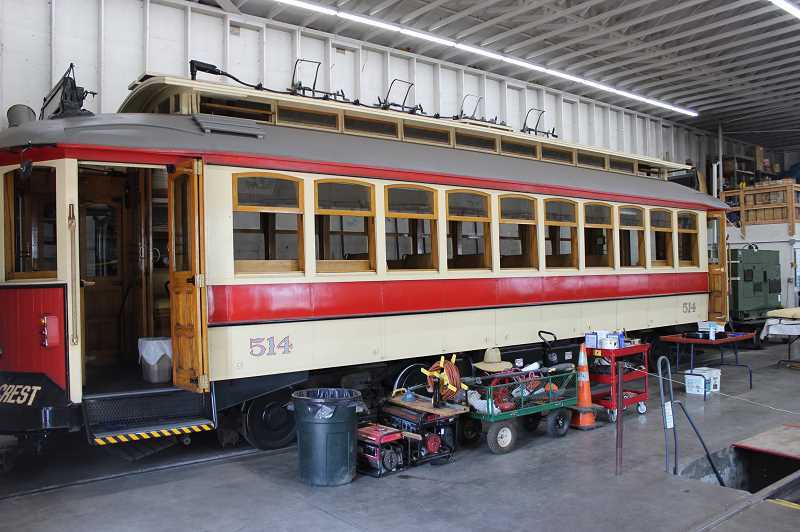 Trolley 514 immediately became the line's primary vehicle, while trolley 513 spent several years in the car barn in Lake Oswego undergoing extensive repairs. The reconstruction of the Sellwood Bridge in 2016 added a passing track in the middle of the single-track corridor, raising the possibility of running two trolleys simultaneously for the first time in the line's history. "The question then came up," Fox says. "If we restore the second trolley, how are we going to power it?" Running a second trolley would require building a second diesel cart, but the operators also began looking into alternative power options and found that advances in lithium-ion battery technology offered a potential new solution that wasn't available back in 1989. According to Dave Rowe, a retired TriMet light rail maintenance engineer and the group's volunteer trolley mechanic, the idea emerged to equip the trolley with a battery pack mounted under the floor, which could power the trolley on trips to Portland and be recharged inside the trolley barn in Lake Oswego. The volunteers began looking for a supplier for a second generator, but resolved to investigate the battery idea as well. "We thought we'd just go to Tesla and get a battery and that would be it," Fox says. "Turned out it was more complicated than we thought." Trolleys 513 and 514 were built in 1992, Rowe says, but they were designed to be perfect replicas of 1920s-era Portland streetcars. That means they use DC (direct current) electric motors instead of the AC (alternating current) motors that drive modern electric cars and light rail trains. DC motors are less efficient than their AC counterparts, Rowe says, because they use resistors to lower the power supply voltage while the trolley is running at slow speeds, releasing the excess power as heat. The wasted power is less of a concern when the trolleys are drawing their electricity from a generator, Rowe says, but the volunteers calculated that if they simply hooked a battery up to the DC system in place of the generator, it would need to be recharged after every trip, which would require installing an expensive fast-charging station. "When you switch to a battery, you can't waste power," Fox says. So Rowe and the other volunteers went back to the drawing board and came up with a broader plan to completely rebuild the trolley's electrical and propulsion systems, converting the entire vehicle to AC motors. That bumps the price tag up considerably, Fox says, but the tradeoff will be a much longer maximum range coupled with all the benefits of a modern electric vehicle — fewer maintenance issues, regenerative braking and zero-emission operations. It'll also be a more authentic experience for riders, he says, without the noise and fumes from the generator cart. 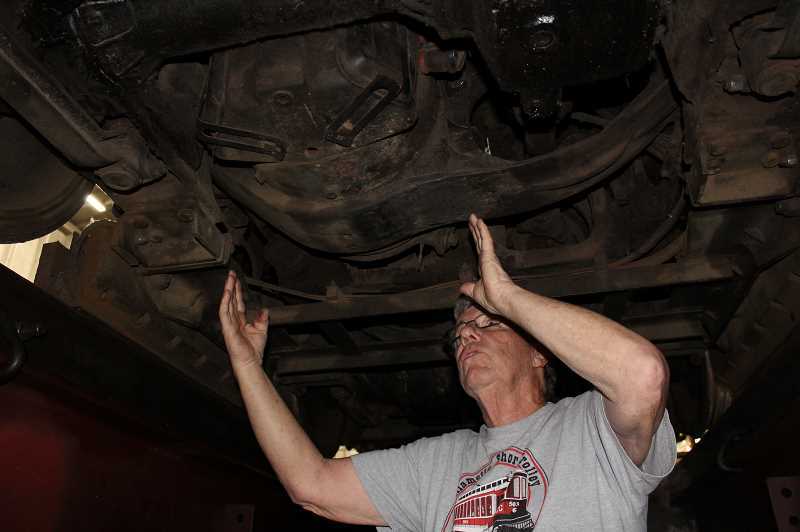 The operators already have a plan for the retrofit, complete with designs for a custom battery from EVDrive, a Hillsboro-based contractor that specializes in retrofitting older vehicles with electric propulsion systems. The 750-volt battery will have capacity of 80 kilowatt-hours, which is about the same as a battery on a Tesla Model S sedan. With AC motors, 80 kWh should provide at least 50 miles of range, Fox says — enough for the four round trips per day in the trolley's current operating schedule. The trolley can then recharge overnight using the car barn's existing electrical supply, without the need for a fast charger. 50 miles is a shorter range than the roughly 250 miles available from a Tesla with an equivelent battery. But considering the 48,000-pound trolley outweighs a Tesla by a factor of ten, the math still works out in its favor — a product, Rowe says, of the effeciency gained by running on rails rather than roads. All of the pieces are in place, Fox says, but none of the work can begin until $232,000 in funding is secured, and the group plans to spend the next several months asking each of the consortium members to chip in toward that goal. In the meantime, Trolley 513 has finally been restored to full operation using a second generator cart, and the operators recently began running both trolleys at the same time. It's been a resounding success, Rowe says, and the group plans to use both trolleys for this year's annual Tinseltown Trolley event during the holidays. Fox and trolley volunteer Bill Failing attended a recent Lake Oswego City Council meeting to present the idea and asked the City to contribute $40,000 to the project — half as a grant and half as a loan. "We need to get this project underway, and we need your help," Failing told the council. Councilors responded enthusiastically to the plan, and City Manager Scott Lazenby suggested that the City could supply the requested grant from the general fund, with the additional loan possibly coming from the tourism fund. The operators have selected car 514 as the test case for the battery project, with 513 serving as the line's main vehicle in the meantime. If the project is a success, the operators say they'll consider a similar conversion for 513 in the future. Once the conversion begins, 514 will be out of commission until the project is done. (Friday and Saturday trips currently are scheduled through the end of October.) Rowe and other volunteers will work on the motor conversion while staff from EVDrive install the battery. The process will take at least a few months, but Rowe says the group isn't going to come up with a more precise schedule. "Never give a time estimate on a new project," he says, laughing. "Any time you have a learning curve, you start slow."